The 2017 Skoda Rapid Spaceback has finally been revealed to the public, ahead of its appearance at the Geneva Motor Show. The model has received a significant facelift for this year, but the changes go further than skin deep. Let’s take a look at five things that you can expect to find on this latest Skoda offering. The previous model featured a 1.2 litre powerplant, but that has been replaced for this release. In its place, we now find a Volkswagen 1.0 litre, three cylinder turbocharged engine that is available with either a 70kW or an 81 kW power output. There are three other engines available on the European specification models; they are a 1.4 litre turbocharged petrol engine that generates 92 kW and a 1.6 turbodiesel powerplant with two variants that generates 85kW or 66kW of power respectively. All of the new options of drivetrains are fitted as standard with some useful new features. There is an automatic stop/start engine that will make urban travel in busy traffic much easier. There is also a brake energy recovery system that collects kinetic energy and stores it as electrical energy. The Rapid Spaceback has new headlight internals, there are bi-xenon main units fitted, and these are underscored with LED driving lights. The headlights have dusk sensing capability and automatic high beam activation. The lower portion of the redesigned front bumper houses new fog lights that are seated in a chrome bar on higher specifications. At the rear, there are tinted tail lights that have optional LED lighting elements available. The Rapid Spaceback has an updated instrumentation pack with the following features: a new infotainment system, smartphone mirroring, Android Auto, Apple CarPlay, a pair of rear USB ports, a surround sound audio system and WiFi hotspot functionality. Skoda already has a 5 star ANCAP safety rating on all of their vehicle, but they have decided to focus on safety even more in the years to come. Bearing this in mind, we have two new safety features on the Rapid Spaceback; they are a new city emergency braking system and fatigue detection. The Skoda Rapid should be on sale in Australia from September onwards. If you’re shopping for a Skoda Rapid Spaceback for sale, contact us here at Skoda Perth. We have an impressive selection of both used and new cars for sale including the Rapid Spaceback. 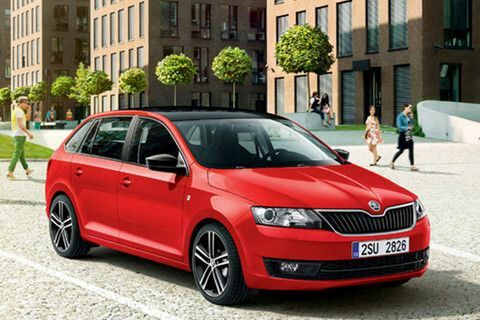 We would like you to join us for a test drive so that you can experience the Skoda driving experience for yourself. If you need finance, you will find our rates competitive, and our financing packages are tailored to your unique circumstances. Our sales team is standing by to advise you on the latest Skoda Rapid Spaceback price and to answer any other questions you may have.